Empowered according to the Ancient Dtamra Pichai Songkram Ritual methods, with the Wicha Dta Pra Narai Song Krut. Invoked with all eight Incantations of Psalms to Prai Narai, the Powerful Master of Metta and Justice of Good over Evil. The Pra Narai Amulet lends Maha Amnaj (Power, Dominion and Command Obedience), and Metta (Likeability and respect from Others, who listen to your suggestions). The mixture of Amnaj and Metta allows to both Command in a Dominant Fashion as well as to Convince in a passive Suggestive manner. This allows to Command Underlings and to Convince and Influence Superiors to ones own Views and Opinions. Bucha to Pra Narai Song Krut is also deemed to Endow the Blessings of Succesful Business (Kaa Khaay) and Maha Amnaj (Power) along with Evasion of Obstacles and Harmful Accidents (Klaew Klaad). The Garuda protects you and your Institution (Business and Household, land and Property), and Lends even more Maha Amnaj Magic to the Amulet. Vishnu (Pra Narai) has his collection of Cosmic weapons in his four hands to cover all Dangers and Bestow all kinds of Blessings. 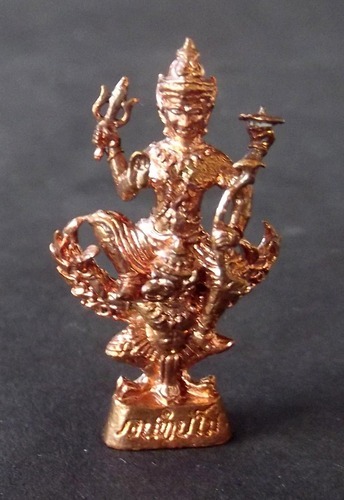 Success and Achievements are made increasingly possible with the Power of Pra Narai and Garuda to remove your Obstacles and to Dish Out Justice to Ill Wishers. This Master Amulet provides the Strengths Blessings and Protections of Pra Narai and of Paya Krut, resultiing in the full compendium of Metta, Kong Grapan, Maha Lap, Klaew Klaad, Gae Aathan, and Maha Amnaj Magic. 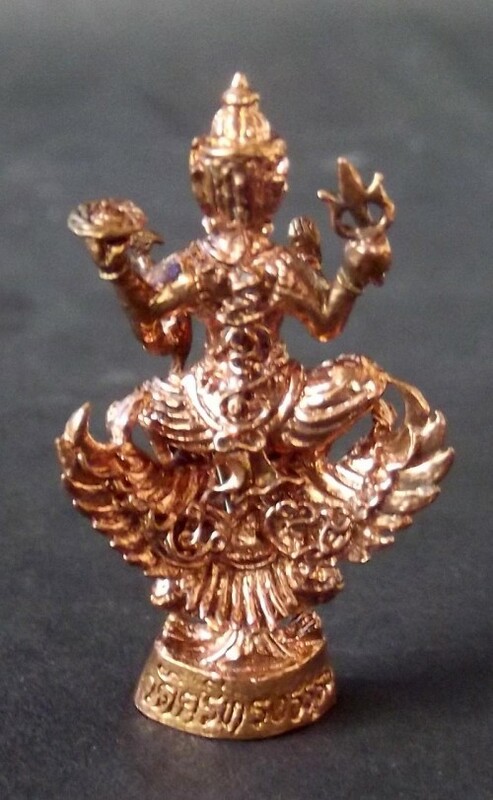 Despite being an All-Rounder as far as Extensive Powers is concerned, Pra Narai Song Krut is by no means Mild in each type of power, rather, is a Mighty Superior Amulet with the Power of one of the Oldest Gods Human History can recall – Pra Narai (Vishnu Narayan) riding on the Mighty Paya Krut (Garuda). Blessed in a major Maha Putta Pisek Empowerment Ceremony after a 3 Month traimas Empowerment during Rainy retreat at Wat Sri Song Tam, with various Master gaeji Ajarn Guru Monks present to assist in the empowerments. The Narai Deity is a Punisher of Evil and is thus a Patron Deity of those involved in Law Enforcement, as well as those who are in the Middle and Upper ranks of Officialdom, or are Officers in the Military. 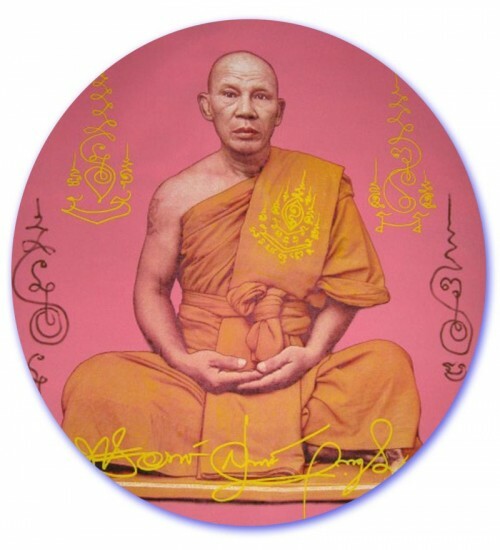 Ordained since 1964 – Luang Por Supot, of Wat Sri Song Tam is a Gaeji Ajarn of the Modern Era who is recieving a massive following of Devotees who revere his amulets. His amulets are becoming very prized and treasured. 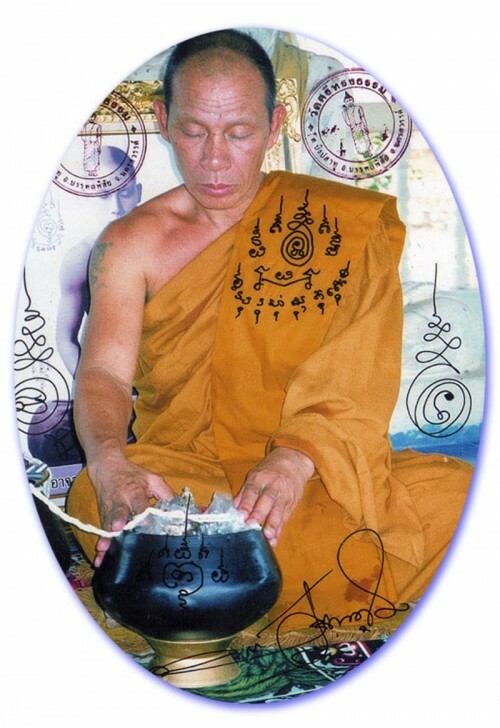 His choice of remaining Faithful to the Classic Amulets of Thai Buddhist Tradition and work in preserving the Buddha Sasana is worthy of Respect and reverence, and the Power of his Amulets is becoming ever more apparent, as word spreads about the successful experiences of the Looksit.